Please call for current gold pricing. Free Shipping. 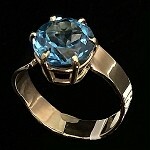 Blue Topaz is found in Brazil, Sri Lanka, Pakistan, and Russia. On the Mohs scale of hardness, it is an 8. 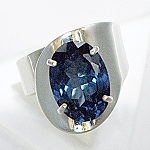 Blue Topaz naturally is pale and is enhanced with irradiation to achieve the deeper blues. 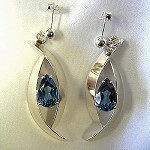 in our Sterling jewelry and Natural Blue Topaz in our Gold jewelry. 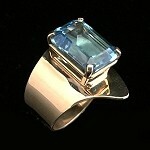 Topaz is said to calm a bad temper and give strength, to improve mental clarity, focus and to increase confidence. It is also recommended for mood swings, insomnia, worry, fear, depression and exhaustion. Avoid direct sunlight and exposure to heat which may cause color to fade. Always avoid contact with chemicals. Clean by gently scrubbing with a designated soft “baby” toothbrush and mild dish soap (not lemon scented) and warm water. Do not use an ultrasonic or steamer.